>> plan is getting a chilly reception on capitol hill . chuck todd has more on this. good morning. what can you tell us? >> reporter: good morning. it will be the political battle of the year. it will set the stage for the 2012 presidential race . president obama calls the budget an essential down payment. republicans call it literally d.o.a. >> i guess i would say debt on arrival. >> reporter: almost before the ink was dry the political punches started to fly. the budget promises to cut the deficit in half in two years, with new spending on energy, education and high speed rail and cuts on democrat yk party favorites including summer school pell grants , block grants and assistance with heating bills for low income families. >> the only way to make the investment in the future is if the government starts living within its means. >> reporter: two-thirds of savings would come from spending cuts, the rest from tax hikes. the president's budget misses is message sent by voters in the last election, republicans say. >> it's a patronizing plan that says to the american people their concerns aren't his concerns. >> reporter: republicans continue don't have a plan of their own. >> it is premature to talk about what's in the budget given that it hasn't been written yet. >> reporter: house republicans are revamping the budget for the rest of this year and that has drawn fire from key obama officials. >> the scope of the proposed house cuts is massive. the truth is cuts of that level will be detrimental for america's national security . >> reporter: defense secretary robert gates joined secretary of state clinton criticizing the cuts. and a former president will be honored today, will get the presidential medal of freedom , former president george h.w. bush . >> thanks so much, chuck todd . 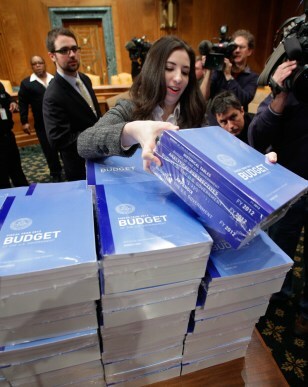 Copies of President Obama's 2012 budget are delivered to the Senate Budget Committee by staff member Dylan Morris on Capitol Hill in Washington on Monday.